What’s better than leash-free play for your favorite pooch? Not having to carry the leash once your dog is running free. Brian Dagnon was sick of carrying an empty leash when he went trail running in the Pacific Northwest with his dog Fletcher. He and his fiancé Paula Johnson came up with the idea for a retractable leash built into a collar, so they could let Fletcher run and swim freely but still have access to a leash when they needed it. The leash had to be strong enough to control large dogs like Fletcher, a 110-pound black lab who likes to chase deer and crows. But it also had to be compact. After years of prototyping and many miles of running, Brian and Paula debuted the Release N Run collar. It’s made with Spectra, a lightweight fiber that’s 15 times stronger than steel. Inside there’s a retracting mechanism that was originally designed for scuba gear (so you know it can handle a swim in salt water) and for securing military weapons (so you know it’s reliable). Your best friend deserves to run around without a leash every once in a while. So do you. Get ready to romp unencumbered. A waterproof food and water bowl that folds into the size of a box of Tic Tacs. then enjoying the freedom of never carrying a leash again. I love Jake the dog in the video. Brian said it took all Jake's will not to chase the squirrel that was to the side. Watch and see! After we finally figured out to move the camera it was perfect having the squirrel there to maintain Jake's focus for the video. He has given the leash some good tests with all the squirrels around here! We have the release N run leash for our 85 lb golden retriever. It is awesome. I have two kids and a dog to hike with so the gear gets a little cumbersome. This leash has been such a great invention so that my dog can run free, but the times she needs to be leashed up.. i just have to grab the little loop and we are all good. Many people have commented on the trail about how they would like a leash like that as they have multiple leashes wrapped around their waist. Thanks guys! I've got a run and release collar for my dog, Bailey. I love it! It's great for going to the lake or running in the park. Great product.. would highly recommend it. I'm a convert and evangelical for this leash. It solves all sorts of problems and frees me up to just be with my dog yet be a responsible dog owner (i.e. always have the dog "leashed" when necessary). Brilliant invention. Thanks, Rad Dog! My dog, Ridge, is a very active dog..I have the run and release collar and it works great to take him on walks around our neighborhood. Very good product which I recommend to dog owners who want to have their dogs off leash but still have a leash where necessary. Thanks everyone for stopping by with your experiences! Brian, it sounds like all of your prototyping resulted in a very useful product. Congratulations! I have used the release and run for three years on my 110 pound black lab. It is great to walk/run in the Flathead Lake area, take him swimming, and also to have him on the lease when we are in the residential area. It is durable,washable,and sharp looking. Thanks Raddog for this product. This collar has been very helpful -- when my dog escapes, it is very easy way to bring him back. My dog wears it all of the time and it lets me pull him back from the door and keep him safe. I plan to give this collar to friends who get new dogs or puppies. These really work as well as they say - even better. We've got one of these for our dog Carlo. He's an 80 pound Lab mutt. We use it all the time for hiking, backpacking, mountain biking, and even when he's swimming. We've even bought them as gifts for our friend's dogs. I found found the collar works great! It has been very useful at the dog park when some - overly aggressive dogs get a a little too excited. The leash is a quick and effective way to keep things under control. Does this have a 'stop' mechanism so you can extend the leash to a given length and it will hold? Or is it always retracting? We are active cross country runners and mountain bikers so the Release and Run is a must for us on every outing with our dogs. We purchased our first collar at an outdoor store a year ago in Washington state and have been using it ever since. The collars (we now have 2) have withstood the elements and allowed us to shed our leash carrying duties! We like the fact that if we come to a road crossing it's really easy to get hold of the dogs and keep them safe. Hi Lisa, It does not have a Stop mechanism. We tried to include this in the original design but it made the collar to bulky. However, the tension on the leash is not that great and hardly noticeable to the owner or dog. Very cool concept! For those of us who are constantly loosing leashes this is the perfect product! I have been using the Release and Run collar/leash for my dogs for 1.5yrs now. I now NEVER have to utilize another style leash. Fortunately we live in an area where trails abound and off-leash areas are also in abundance so having this leash/collar combination is invaluable to us when we walk or run with our dog(s). Light weight, extremely durable and utilitarian as it comes. 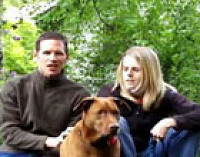 Brian and Paula have come up with an excellent product that I wish everyone who owns a dog could experience. Get one!!! What a cool idea. But I'm curious about a few things that weren't quite clear from DG's video. 1. What's the actual leash made from, and is it a material that wouldn't cause cuts or rope burns if you grabbed it in the wrong place? That's one problem I've had with retractable leashes (usually nylon cord) in the past. 2. How do you grab the handle for the leash when your dog is wearing it? Do you have to get your dog to stop, then reach inside the little pouch? It's great for little dogs too! I have a schipperke and an American eskimo dog. Why carry the leash yourself, when the dogs don't even know it's there? Great idea for hunters, hikers, and casual park visitors. Hi Wade, the leash is made from a combination of Nylon and spectra material (similar to Kevlar) and is similar to the material that hand-held retractable leashes use. 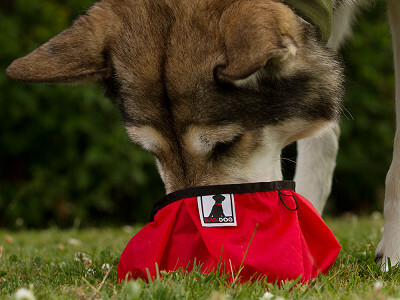 The pouch on the collar was designed so that the handle is towards the top of the dogs neck and about a 1/2" of the leash sticks outside of the pouch, making it super easy to grab on the go. I have no problem grabbing the leash while walking or running. Our 105 lb Golden Retriever, Cooper, LOVES his Rad Dog and so do we! It is so easy and multifunctioning. Every where we take Cooper, people stop us and ask us about the leash/ collar. I absolutely love this lease. We don't use anything but this now. Our dog Fiona always has her lease with her. It is quick to grab when we need to, but out of the way when we don't. If this company had a public stock offering, I would be the first to buy!!!! Raddog's release and run is great for the outdoor person. When I take care my "granddog" he always wears his release and run; therefore I never have to search for his collar and leash. He loves to ride in the car and when we stop for a little walk I just open the door, reach down and pull out the leash. He loves to swim and catch the tennis ball while wearing the release and run. This is a great invention. Thanks Raddog for saving me time is searching for misplaced leashes. No sure if I need a S or a M...I have a 26lb. Cockapoo.....thanks....gr8 idea, I am always off leash w my dog and this is gr8 for the time when I need a leash! @Susan - Measure your Cockapoo's neck size. If it's between 14-16" go with a Small and if it's between 16-18" go with a Medium. We're glad this will work for you! The release and run makes life easier for my girlfriend and I. We go hiking and running a lot and it is so nice to not carry anything. I tell people at the dog park about the collar/leash and they are all jealous. Keep it up Rad Dog! 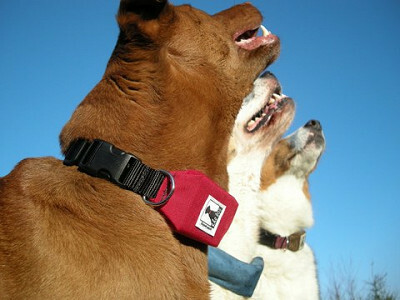 "Rad Dog, based in Bellingham, offers unique collars for active canines. 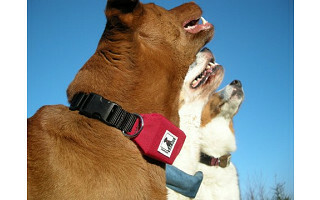 Rad Dog's Release N Run collar incorporates a leash that retracts into the collar. That means dogs can roam free, but when you need to have them leashed, simply reach down, grab the leash tab and pull. A 3.5-foot length of spectra cord (a carbon fiber-type cord that is lightweight yet very strong) unspools from the collar. Sophie found the collar comfortable, she showed no sign that it felt any different from her normal webbing collar. While hiking the Easton Ridge Trail east of Snoqualmie Pass, we let her roam free on the trail (she's well-trained to stay close and responds to voice commands). When we encountered other hikers, we'd simply reach down and pull out the leash cord. The Release N Run proved the perfect solution for this type of use; hiking with well-behaved dogs that occasionally need the extra security of being leashed. The collar is compact and lightweight, making it perfect for trail use, and also works well as a leash to get your dog from the car to the off-leash areas around town." Hi there...I'd like to get this as a gift for a friend who has a black lab...but of course, I don't know the doggy's actual neck size. I do know that she is a good size lab. Do black labs tend toward one particular size or do I really need to call them and spoil the surprise? Thanks so much!! @cktango - I have been in touch with Brian and he says that you will need either a L or XL. If you could discreetly get the dogs weight - he could advise with more certainty. Question: Are the collars adjustable? I have two female goldens, each about 60 lbs. One has a 16 inch neck and wears a 17 inch collar. The other has a 17 inch neck and wears an 18 inch collar. I am hoping Mediums will fit them both because I'd prefer less bulk. Please let me know which size you suggest since they could go either Medium or Large. Thanks! @Jen - I have been in contact with Brian and he says: The medium will fit both of their necks, but due to the weight they should order a large as the maximum recommended weight for the small and medium is 50 #'s. Based on neck size the XL will fit our Rotti, BUT he's 130lbs. Is it possible for him to wear one of these? I really love the idea by the way. Also, I was wondering about the return policy. Even if it won't work for our big dog, I would like to try on our small dog, just want to make sure it works well for him. Thanks! @Amber - these are not recommended for 130 lb dogs but if it doesn't work for your smaller dog, we do have a 30-day return policy. Thanks for stopping by! How is this collar/leash on smaller dogs? I have two dogs that would fit the small size collar, but it seems big in the video. @Madeleine: The small and medium are smaller in size and bulk, but if the dog is under about 20# the leash tends not to retract as smoothly as with bigger dogs. The pouch part on the small and medium is about 1.5 wide (so only a 1/2” wider than a normal 1” webbing collar) and is about 5/8” thick. Hope this helps. @Tim H: I ran this past Brian and he would not suggest attaching it to yourself as it wasn't designed for that purpose. It also isn't much longer than the one you are currently using, so it probably wouldn't give you the clearance you are hoping for. As far as size, yes, the medium would be the size that you should go with. Thank you for stopping by! I'm wondering if the leash can lock in the extended position and not always be ready to retract. My dog usually runs on a very loose leash, so I want to lock it in the extended position to replicate what it's like when he runs with me now on a regular leash. But as soon as we're able, I let him run with me off lead, and that's where I'd want to be able to retract it. So does it lock and act like a regular leash or is it always pulling and trying to retract? @Trish Whitehouse: The leash does not lock, it constantly retracts. It is great for when you have your dog off leash and need to just grab the dog in certain situations such as a small child or mean dog is in the vicinity, or to get to the car after your walk. The dogs can even swim with them on. Rad Dog is not meant for long leash walks, more of security blanket when walking the dog off leash. I have an almost 6 month old standard poodle. He weighs about 35 lbs and is getting bigger every time I look at him. His neck size is close to 14 inches but know it is going to get bigger quickly. Would the L be too big for him or should I order the M and hope it fits. I am very excited about ordering the leash. @Erica Cooper: Puppies do grow too fast, don't they? I have a miniature poodle that's grown up on us... too fast. A full grown standard poodle is going to be probably 45 - 70 pounds. So when it's full grown, it could need a size Large. If you want a collar that will work as it's growing, a Medium may be the way to go, but once it's full grown, you may have to go up to a Large. 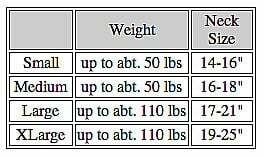 Here is the sizing chart from the Grommet DETAILS tab that you might find helpful.